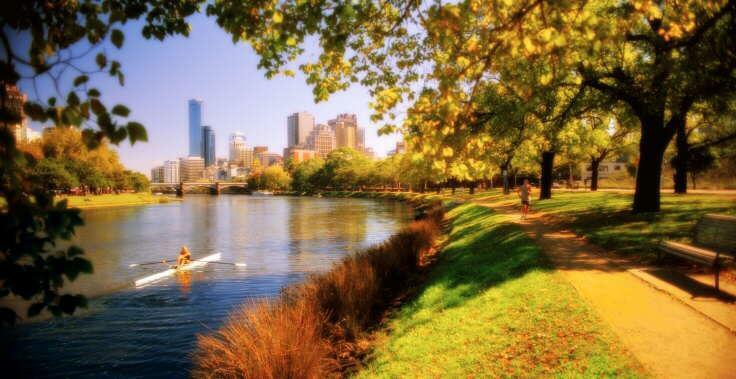 One of few capital cities in Australia, indeed the world, where picturesque parklands and a huge flowing river exist within minutes of the bustling city centre, Melbourne's Yarra River is a rare environment just outside the metropolis. Featuring the southern hemisphere's largest port, the river runs over 240km and is an extraordinary exception of nature meeting the modern world. 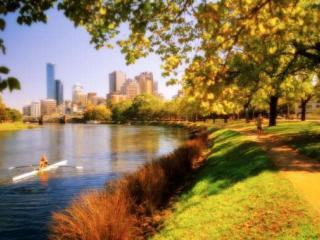 There are two main courses along the Yarra River, either the upper river journey or the downstream track. The upper follows Herring Island around to the Royal Botanical Gardens and along the main sporting arenas while the downstream heads past the Port of Melbourne and the Casino to the World Trade Centre. Both courses can be seen in one day and there are a number of river cruises that will take you through the sights along the way. Yarra River cruises are a popular tourist attraction and there are a number of options to choose from that depart Melbourne. The Melbourne River Cruise is an excellent overview of the waterway and is aboard an enclosed boat which protects you from the sun and wind however the MV Melba Star is ideal if you're feeling a little indulgent as this new attraction offers a touch of luxury. There are also a number of floating restaurant cruise boats which are a unique take on a dinner cruise while an old steam boat offers a bit of history to the experience. The Yarra River shuttle service is an affordable service that stops are popular destinations such as Southbank, the Melbourne Aquarium and Federation Square and operates from 10 am to 8 pm. Private boat charters and gondola rides are also available if you prefer a more intimate experience.